Listen to this track by London R&B quintet you wouldn’t let your daughter go out with, The Rolling Stones. 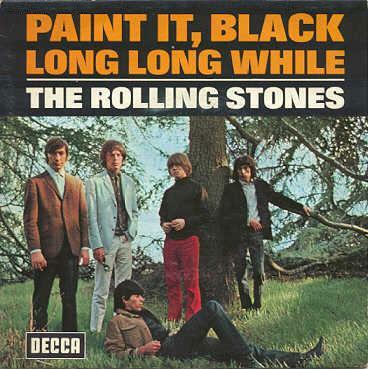 It’s “Paint It Black”, a number one record released as a stand-alone single in the UK in May of 1966 as the harbinger to their landmark LP Aftermath. In North America, it was added to a modified version of the record as the opening track. This song by the Stones remains to be one of the most sonically varied and innovative tracks in their now very extensive catalogue. Sure, there’s that undeniable sitar part. But there’s so much more happening around it so as to make that part just one of many important aspects of this song, which seemed to foresee post-punk even before the word “punk” was applied as a musical term. Of course, this song also caught the band at a crucial point in their career, reaching new compositional heights. It also was a time when the dynamics within the band were shifting greatly, and not completely comfortably, either. Like many of their peers by 1966, the Stones were moving away from the idea of a record being strictly a commercial product. Their singles and albums were meant to be artistic statements as well, meaning that more stylistic risks were being taken in their creation. Here, those risks certainly pay off, with few records sounding like this one at the time. Thematically too, this is not your standard “my baby left me” song. Instead, it plumbs the depths of existential despair in a more European take on the theme “I got the blues”. The band had always been interested in the blues since they began, of course. But this is something completely other, catching the band at a time when they were taking it up to another level entirely, artistically speaking. The joys and wonders in “Paint It Black” are so numerous, and it’s hard to even know where to start. Brian Jones’ sitar contribution aside for the moment, Charlie Watts’ drumming deviates from his normally crisp snare-work and becomes all about the echoey toms that make the whole thing sound downright primitive. The production on the song, credited to then-manager Andrew Loog Oldham but more likely thanks to de facto musical director Keith Richard(s), makes the whole thing sound subterranean, as if singer Mick Jagger’s voice is coming from inside his own head. Then, there’s the subtle percussion in the background, probably another Jones addition actually; are those castanets? Their insect-like clicking make for a singularly disturbing texture that adds to the unsettling nature of this song. As for that sitar part, Brian Jones had been interested in exotic instruments for a while, adding many non-traditional pop song textures to Stones tracks by this time. The sitar was certainly one, on which he received some tutelage from Harihar Rao, an acolyte of Ravi Shankar. Besides any instruction he received on the sitar, Jones was known for his gift at being able to pick up virtually any instrument and find a way to make music out of it in very short order, and to conceive of instrumental textures that would not immediately occur to others in order to make the records sound better. Every band needs someone like that to help them get to where they need to go, especially a band as ambitious as the Stones were becoming by 1966. For this, the Beatles had George Martin. The Stones had Brian Jones. That was his key strength, which contrasted his seeming inability to write songs in the way that his bandmates Jagger and Richards seemed to be able to do with ease, especially by the release of Aftermath when their writing partnership gelled fully. In the writer’s market that is the pop music industry even today, this imbalance of power caused some tension between the three creative heads, exacerbated by how successful they were becoming. The cracks became bigger as more pressure on them was applied. If only Jones had been able to find his groove within the band as its chief colourist instead of its “leader”. If he had given up his bid for dominance (and his prodigious drug and drink intake, too), maybe he would have thrived instead of being booted out by 1969. Maybe he would even be alive today. It’s impossible to say. For me, “Paint It Black” and the fate of Brian Jones are inextricably linked in that way, despite all the colour he added to some of the most potent and evolved pop music in the twentieth century. The Rolling Stones continue to roll on at rollingstones.com. At the time of this writing, they are making noises about a new album in the works, their first since 2005’s A Bigger Bang, and a purported return to their blues roots to be released sometime this year.